Cindy Crawford announced the final completion of the model's career in 2016, when she was 51 years old. However, even the fact that one of the "golden five" top models is now quiet and not glamorous living with her husband in Malibu, is not at all an excuse for Cindy to forget about herself and relax. She finally switched to the right food, eats a little and only three times a day and every day she works out. And as the admirers of the beauty noted recently, it seems that the former top model finally canceled the aging. In the last photo, even without cosmetics, Crawford does not look like she's 53 at all. And rather than the older sister of her 17-year-old daughter Kaia Gerber. Or even her the same age. Does they look like Mom and Daughter? Sisters! "Yes, I have other skin, hair, body. I work on myself, but I realize how old I am. Now it's much harder to keep myrself in shape. But I see my friends and realize that they are beautiful, and I'm not about appearance. At such times I understand that women should treat themselves less critically. The 50-year-old Cindy would like to advise the 30-year-old Cindy not to be so demanding of herself, "Crawford recently admitted in an interview with Hello! Cindy Crawford leads a healthy lifestyle. And a little earlier in the interview to this same publication, she revealed some secrets of her beauty. - I do not have to motivate myself in some way to lead a healthy lifestyle. I eat the right food only because I feel better. You just try - and you will understand how great it is. 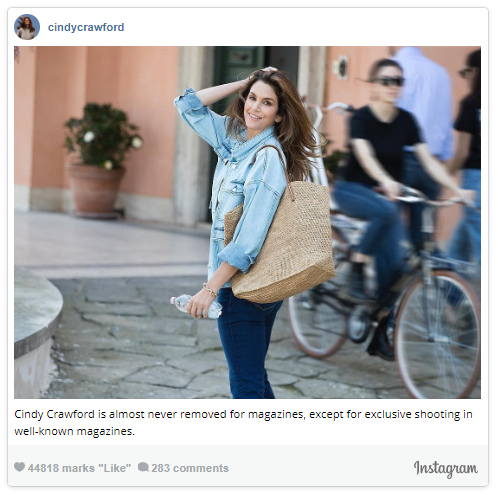 Cindy Crawford doesn't shoot for magazines, except for exclusive shooting in well-known magazines. - With age, I began to wake up with a swollen face, although earlier I had no such problems. Then I removed from my diet everything that contributes to this. So, I now only eat sushi with lemon, and not with soy sauce. And by the way, it's even more delicious. My son followed my example and now does just that. Also, I stopped drinking wine, because after it my eyelids swell. Fortunately, after tequila this does not happen, my husband produces an excellent tequila. Even without makeup, Cindy Crawford looks great. - About 20 years ago I met a woman who regularly does exercises for the neck. She explained to me that if you keep these muscles in tone, then with age it also helps to maintain a normal face oval. I included these exercises in my training program, everything is simple there. Lie on your back, chin up. Now lift your head slightly and start pressing your chin to your chest, then return your head to its original position, but do not lower your head to the floor, keep it on the weight. I do three sets of 10 repetitions, but you can do less or more. I alternate this exercise with the following. Also lie down, raise your head slightly and, without lowering it to the floor, start turning: to the right - straight to the left - straight. And in this case, three approaches 10 times. - I do not have any special secret of prolonging youth. I think that I look like this because I have been caring for myself, my face and body for many years. I have never been a party-girl, I do not smoke, I work out for 25 years, I regularly drink water, I always use sunscreen and take care of the skin. 80 percent of what I eat is healthy, healthy food. But, perhaps, the main secret is to live with a feeling of gratitude for what you have. When you are grateful, you just can not feel unhappy. Real beauty is the energy that you radiate.